Maxine Murphy, co-chair of PUSH Buffalo's board of directors, stands in front of her home, a net-zero house built and maintained by PUSH. After decades of economic downturn, Buffalo had been seen as a Rust Belt city in decline. But grassroots-level work by Cornell University with community partners on sustainable redevelopment and improving livability is changing that. The Partnership for the Public Good (PPG), founded in 2007 at Cornell in Buffalo by the ILR School, works with a diverse network of stakeholders. 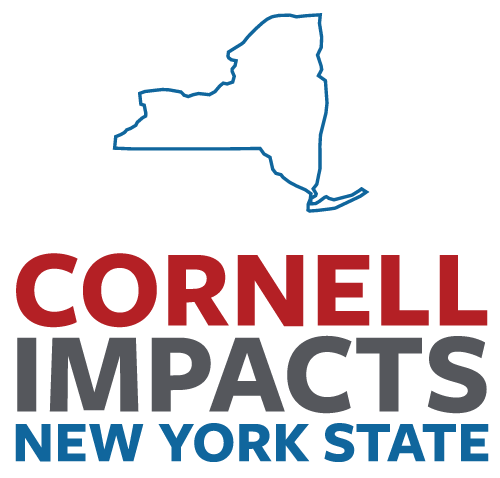 Cornell and ILR have been embedded in the city since 1946, conducting outreach and research – work that has accompanied the city through economic boom times, recession and revitalization. “Buffalo at the time was a powerhouse of transportation and industry and culture. … There have been many transformative periods when ILR didn’t just react, but helped create progressive change in the economy,” said PPG board chair Lou Jean Fleron, an ILR extension faculty member whose work in Buffalo spans more than four decades. ILR’s extension work, including PPG, is intended “to strengthen institutions so that they can more effectively change the world and create an economy that works for everyone,” she said. Working to effect lasting local change and to create policies advancing equity, sustainability and cultural vibrancy, PPG is an umbrella for community, social justice and nonprofit organizations in the Buffalo area. It leverages Cornell resources for its community partners, including research expertise and student interns. PUSH was among the first 36 partners to sign on in 2007, and PPG now provides policy development, advocacy and research to more than 280 organizations in the Buffalo-Niagara region. “For PUSH, it’s meant having access to best practices from around the country, written up on a monthly basis,” Bartley said. Cornell partners with community organizations like PUSH to support Buffalo’s growth and redevelopment. Cornell in Buffalo and PPG also host Buffalo Commons, a digital library of research on western New York with tools to help community organizations and researchers connect, collaborate and share strategies for organizing, advocacy or creating green jobs, for example. More than 170 researchers from Cornell, the University at Buffalo and other institutions have contributed to the resource, which also gives residents direct access to information on local policy and opportunities for civic engagement. “We’re trying to make Buffalo a model of urban regeneration that really warrants the attention of researchers, even as we use higher education for innovative thinking and making it a better place,” Fleron said. Once full of abandoned houses, Buffalo’s West Side neighborhood is continuing on a path of revitalization. “PUSH is the organization we’ve worked the most with, on local and state policing, greening the region, New York state affordable housing programs, and pushing to get cities to emphasize sustainability more,” said Sam Magavern, PPG executive director. Energy-efficient housing and sustainability efforts by PUSH have extended to providing jobs while protecting Great Lakes freshwater resources – the focus of PUSH Blue, a related initiative established in 2009 and dedicated to “building a blue economy” through sustainable landscaping projects and youth training programs. “They figured out how to put disadvantaged workers to work on the storm water problem,” Magavern said. Aaron Bartley, Cornell ILR visiting scholar, speaks about PPG’s partnership with PUSH Buffalo. PPG and PUSH produced a white paper in 2008 showing how “to improve water quality in a city like Buffalo that has really old sewer systems without digging those systems up, which is a billion-dollar project,” Bartley said. “PUSH had been doing some of that work, digging rain gardens and bioswales to capture water runoff and make it seep into the ground rather than going into the sewer system. PPG took an interest in that and documented our work … to really systematize what we are doing,” he said. The report was circulated outside of Buffalo, and soon Bartley was fielding calls from the Ford and Rockefeller foundations, “wanting to learn specifics about green infrastructure and how communities can create jobs,” he said. Rahwa Ghirmatzion, executive director of PUSH Buffalo. PUSH continues to attract foundation grants as well as grassroots support for its many projects. “The biggest amount of support comes from members of this community,” said Executive Director Rahwa Ghirmatzion, whose family emigrated from Eritrea to Buffalo. She has lived on the West Side for 26 years. Now with a paid and volunteer staff of 50, PUSH has put families in homes for 12 years, renovated the long-neglected Massachusetts Avenue Park and established job-training houses for local youth learning the building trades. The former School 77, empty for a decade, was recently redeveloped into senior housing and community space. PUSH holds monthly meetings of community members and engages them in ongoing planning efforts to prioritize development. After leading PUSH in generating more than $45 million in sustainable housing and commercial development, Bartley stepped down as executive director this year and is now an ILR visiting scholar. He is leading workshops this fall on Cornell’s Ithaca campus and teaching a course in the spring called Organizing and the Next City: Land, Labor Capital and Community in Post-Industrial Urban America. West Side resident Bob Jahnke, a longtime member of the PUSH Community Development Committee, walks through one of the community gardens in his neighborhood. Another PPG partner, the Massachusetts Avenue Project (MAP), puts young people to work growing and delivering fresh food to the community. MAP is based within PUSH’s 25-block Green Development Zone on the West Side, and the purchase of four PUSH lots in 2015-16 “expanded our farm by about a third,” Picard said. “Sam and the PPG staff have been great partners in terms of research and policy work on urban growing and our farm-to-school initiative. They did a white paper on urban agriculture several years ago. … Just having that in our back pocket helps in moving things forward” with policymakers, she said. Margaret Lee (ILR ’20) and Jenny Chan (HumEc ’19) speak with Jim “Swannie” Watkins, curator of Silo City, a historic industrial site on the Buffalo River. Much of PPG’s work to influence public policy is determined by a Community Agenda laid out each year. Local residents and community groups identify needs and vote on issues of the most concern – such as criminal justice reform, fair housing and public transportation. “The first year we did the Community Agenda, in 2010, identifying the issues to advocate for, the Common Council of Buffalo adopted seven of the 10 planks to push policy forward,” said Ghirmatzion, a PPG board member. This year, ILR launched a Careers in Public Service program in Buffalo, funded by the New York State Assembly to engage students in learning about public policy by working directly with city officials and community leaders. The program will inform the next generation of civic leaders, Fleron said. In the long-running High Road Fellowship program, ILR matches about 20 Cornell student interns each summer with PPG partner organizations working on community and economic development. “We’ve had consistently high-quality interns from Cornell who would be able to, say, take a list of properties that were vacant, go downtown, do property research … and come back with a real picture of why those properties were vacant, who owned them, and how we could go about getting ownership or challenging the owners,” Bartley said. Clint McManus, M.R.P. ’15, worked with PPG in 2014 when he was a graduate student in the field of city and regional planning. He researched a section of Buffalo’s East Side, a site of segregation and neglect following a period of deindustrialization in the city. Martha Mendy (ILR ’19), top left, taught English as a second language and citizenship classes through her High Road placement at Jericho Road Community Health Center. Those four economic stressors around land use, urban planning and development continue to have an impact on residents of a city in transition, and remain core issues for PPG, PUSH and many grassroots groups. Ghirmatzion said that the new Fruit Belt land trust, aided by partners such as PUSH and PPG, is looking to acquire up to 50 parcels for affordable housing and community space. Lou Jean Fleron, Cornell ILR extension faculty, speaks about Cornell’s connection with the broader community in Buffalo, New York. Buffalo has seen solid employment and wage increases over the past decade, with growth in medical and tech jobs and in higher education, as home to three state-affiliated institutions and six private colleges. There is new commercial construction and development, and a local and regional commitment to sustainable redevelopment and livability. “More and more people are moving back into the city, and there is a greater sense of how we can build on the assets of the city as well as the people to solve the problems that still exist here, like poverty and inequality and segregation,” Fleron said. Affordable housing is still an issue in the City of Good Neighbors, where the housing market is considered “healthy” in only a few neighborhoods. Economic development spending is in the millions every year, but the most impoverished areas, on the West Side and East Side, are traditionally passed over. The Partnership for the Public Good assists PUSH in supporting housing development that is sustainable – strategically located to strengthen existing communities and ecologically friendly to reduce energy costs and pollution. “Hopefully PUSH and other entities are making redevelopment better, but there has yet to be considerable financial resources dedicated to the far East Side, such as the Broadway-Fillmore neighborhood,” said Katelin Olson, M.A. ’09, Ph.D. ’18, visiting lecturer in city and regional planning. A preservationist, she researched the history of 31 blocks of Buffalo for her Cornell dissertation and led the nationally recognized Albion Main Street Alliance in nearby Orleans County. For PPG’s part, Magavern and the community social and economic justice group Open Buffalo have sent policy recommendations to Mayor Byron Brown’s administration, including advocating for Green Development Zones throughout the city, following PUSH’s model. “I think PPG in another 10 years will be even more powerful than it is,” Fleron said. “That form of collectively developed knowledge – actionable, informed, motivated by the public good – is what is regionally important all across this country. Anchored in Buffalo for 72 years, Cornell is partnered with the community in a very real, intentional way into the future. A digital repository of faculty, student and community research for the public good in Buffalo.